Whole books have been written on the topic of media buying. It is perhaps the most technical and complex aspect of building successful radio advertising campaigns because it entails working with a combination of many variables. As such, it requires not only the support of robust technology but also the acumen that can be developed only over years of experience in specific radio advertising situations, product and service categories, and geographic markets. We'll not repeat here what those tomes on media buying already cover. Not only are they long, they're also often more theoretical than experiential. Theory is great for the academic, but for those of us who need to put points on the board in real-life business situations, the learnings from direct experience are more valuable, practical, and informative. 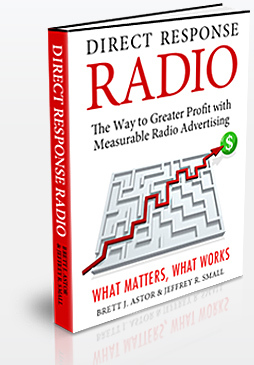 Therefore we'll focus on the key insight you need to understand how media buying works in direct response radio advertising when it's done right. While the creative development of radio ads is concerned almost solely with developing the "right message," the media-buying aspect of building direct response campaigns is concerned with getting that right message to the right people at the right place and time for the right cost . a) Success does not result from getting the right message to the right people at the right place and time for too high a cost . b) Success does not result from getting the right message to the wrong people at the wrong place and time for the lowest cost . Many people approach radio with a "get me the lowest rates" mentality. They ask about getting the biggest discount or talk about getting remnant (unsold inventory) rates. But when you understand the above statements, you can see that effective direct response media buying is not solely about how much you pay. How much you pay for the airtime is, of course, important. The confusion seems to arise when there's a focus on cost to the exclusion of the other elements we've highlighted. When you execute on all of these is when you see amazingly profitable campaigns. Similarly, we've heard many people say, "I have to be in morning drive," or "I have to be in afternoon drive." It's understandable that an intelligent businessperson wants to ensure the media buy is appropriately crafted to reach the "right people," but there is still confusion here about the interplay among the elements required for successful media buying. It's not that black and white. Requiring a certain daypart does not take into account the cost of that daypart. Remember, it's what you get for what you pay. Airing in morning drive may deliver a large number of your customers, but if it comes at too high a cost, then it doesn't matter that you've reached your customers. The experienced direct response radio agency has gained the skills, knowledge, and relationships necessary to procure the kind of media schedules that deliver profitable outcomes. And they may not look the way someone schooled in classical marketing principles would expect them to.